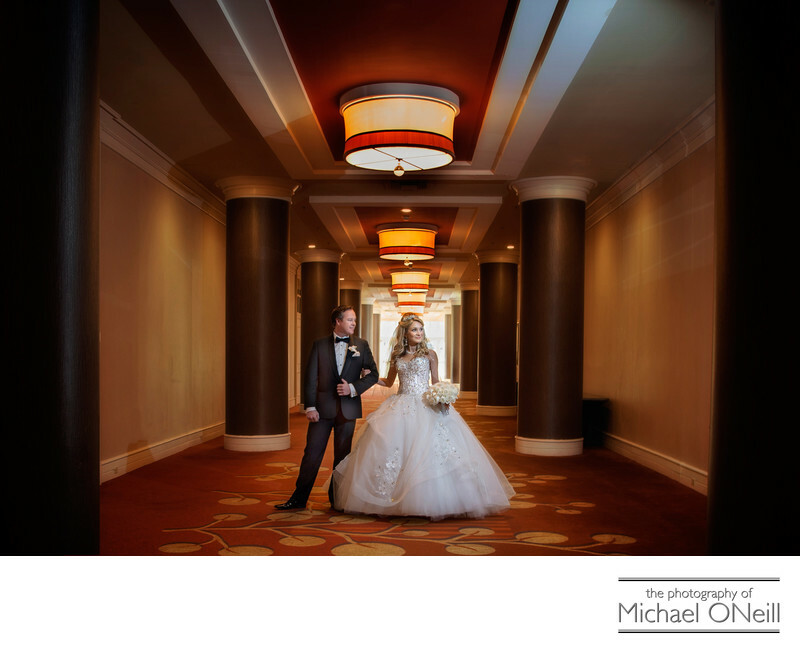 Another image taken in the hallway outside the grand ballroom of The Hyatt Regency Hotel. A strong composition with the bride and groom being framed by the architectural columns that line either side of the hallway. The couple are being lighted by an off camera light which is held by my skilled photographic lighting assistant who is positioned behind the large column on the right hand side of this picture. The light, coming from this off-camera position provides a natural looking directional light on their faces while crossing the brides wedding dress to accent all of it’s fine detail. When you start to plan your wedding and are considering the services of your professional wedding photographer, this should be one of your most important concerns. Every great wedding photographer works with a skilled lighting assistant. Period. The proof is in the pictures. When you go out shopping for a photographer look for this kind of detail in the bride’s dress. You’re going to spend a small fortune on your wedding gown. Make sure you’re going to see all of it’s magnificent detail in every single photograph at your wedding. Every photograph. Not just a few token portraits, but in all of your candid, casual shots as well.